Goya 79, 28001 Madrid, Spanien. 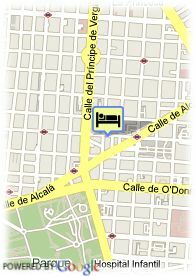 Reformed in 1999.Located 5 minutes from the Alcalá street and about 5 minutes from the "Parque del Retiro". Besides the rooms the hotel counts with 7 spacious apartments for large stands. It is also includes a librery with staple pit. 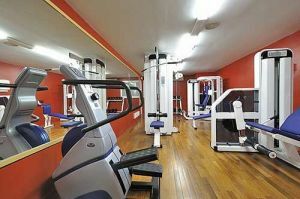 Offers 177 well-equipped rooms with television, DSL internet connection, phone, air-conditioning and bathroom. Bezahltes überdachter Parkplätze beim Hotel (23.54 €). Park, Stadtzentrum, in der Nähe der Altstadt. ältere Kinder und Erwachsene: 42.80 € pro zusätzliches Bett.